Young leadership of the Jewish Home suggested the anti-draft MK move to a place where he feels more comfortable. The young leadership of the Jewish Home party sent a faux flight ticket to MK Basel Ghattas (Balad) Wednesday, in response to his call to Christian Arabs to refuse to enlist into the IDF and to burn their draft summonses. "In view of your call to Israel's Arab Christian citizens, to burn military enlistment orders and, in effect, prevent their integration into Israeli society, we suggest that you offer an example and be the first to do so,” they explained. They also called on Ghattas to resign from the Knesset, burn his Israeli ID card and move to Iran. 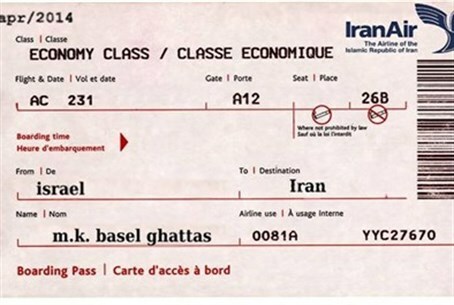 “In order to assist you in this somewhat difficult move, we have bought you a special flight ticket in the Iranian airline, to make things easier for you,” they wrote tongue-in-cheek. DF Radio revealed last week that Christian Arab teens will receive a draft notice, like Jewish ones - but have the option to either volunteer or decline military service. Analysts say the move - which has Israel actively reaching out to Christian youth to serve for the Jewish state - has serious political and social significance. Shortly after the report aired, the IDF made the official announcement on its Twitter page. "Over the next several weeks, the IDF will begin sending voluntary draft notices to all potential Christian IDF recruits," it tweeted. "This will provide a wellspring of opportunity for volunteerism."